A while ago I ordered a book of knitting patterns by a very prolific UK designer, Kim Hargreaves. There are 1,574 of her patterns on Ravelry! This is a knitting superstar who comes up with endless pretty, simple, feminine designs. An on-line bio says she was "responsible for creating the image and philosophy of Rowan" as its head in house designer and the person who oversaw design, photography and styling for the Rowan magazines and chose many of the designers. Now she heads her own company and she publishes these books, one of which (Indigo) I own. I bought it because I was smitten with one of the patterns (Searing), which I have in mind for a hand-manipulated machine knitting project, but that is not what I am working on this weekend. No sirree - I'm making Burnt (Kim Hargreaves has this thing for one-word names). Such a simple but classy little top. 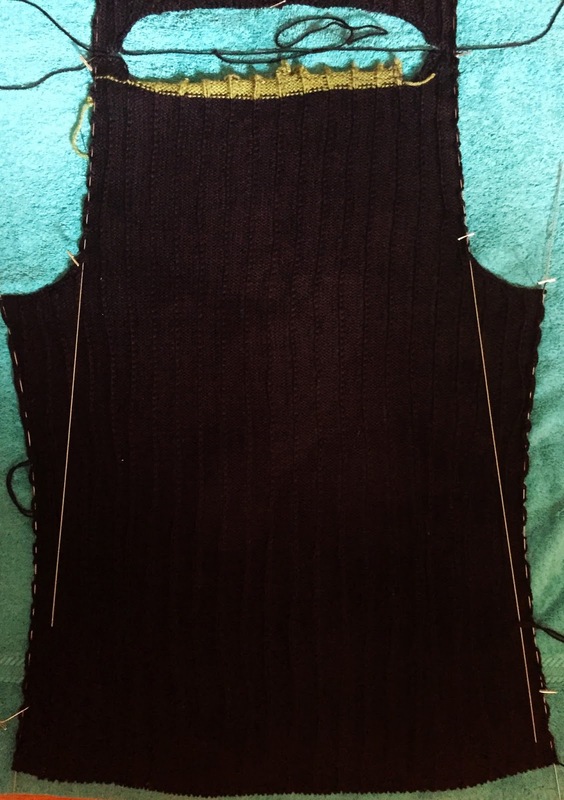 The slip-stitch rib is a cinch on the Passap (CX/N, a rib every 5 stitches). 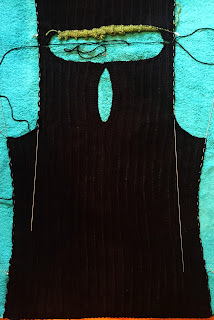 Making it a bit more complex for machine knitting are the vertical darts (3 per side, front and back), and the back slit opening which is faced with garter stitch. I figured out the technical issues and have knitted the front and the back. As usual I had to do some fixing up of the knitting with a needle and yarn, but I will not reveal where and my hunch is that no one will notice. If they do I shall freeze them with an icy stare. 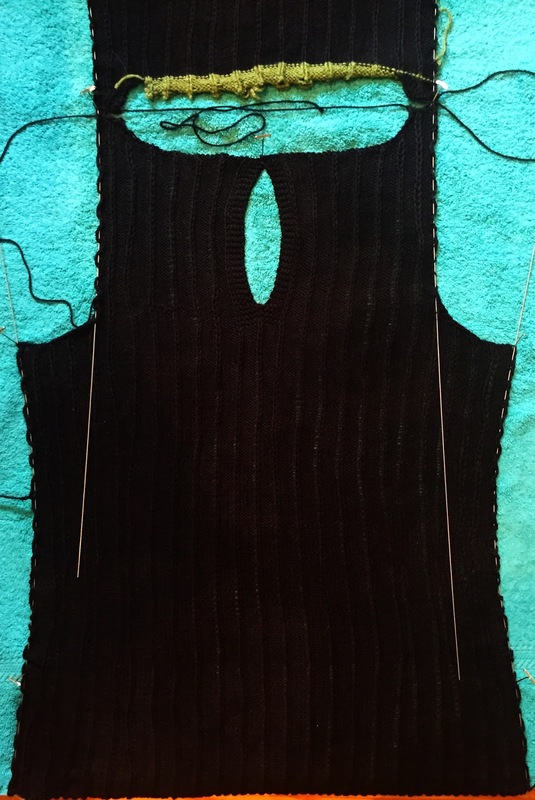 My top is black, which is hard to machine knit with (god help you if/when you drop a stitch and have to go fishing for it) and hard to photograph. 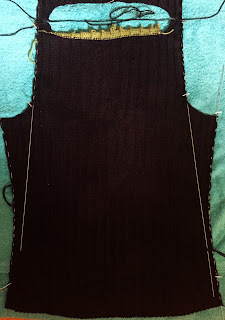 The pieces are now blocking and I'm resting up for the next phase which will consist of machine knitting the neck and arm opening bands (reverse stockinette, which will roll nicely I hope). 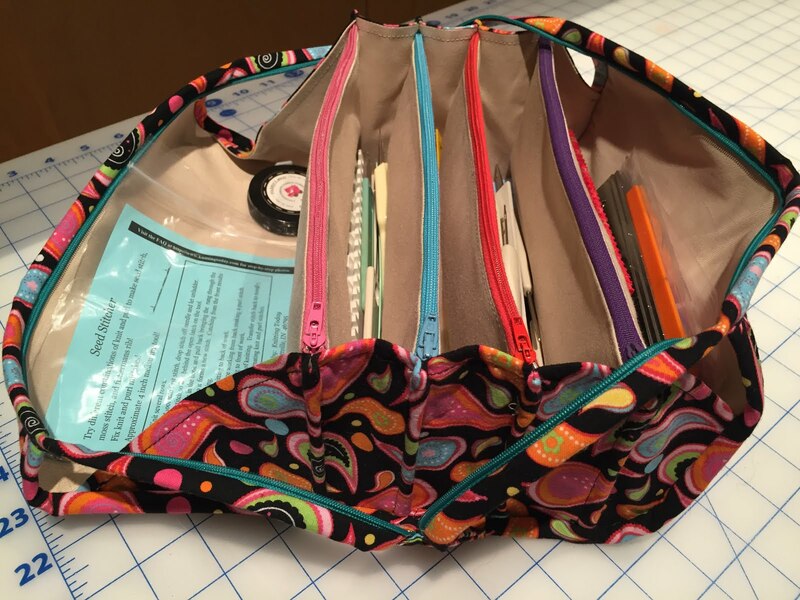 Now I have a hankering for a sewing project. Methinks a shirt dress for summer. Uncharacteristically, I just bought two McCalls patterns and one of them is 6885. I would never have considered it except when I saw Goodbye Valentino's gorgeous version I realized that abandoning the kiddy sunhat and exaggerated shirt tail hem left a pretty, classic dress. I'll be back when I finish Burnt - in the meantime please excuse me while I go stash-diving. It's a jacket. No, it's a cardigan. No, it's both, and it's totally off the beaten track for The Sewing Lawyer, because it is has glitter and sequins. And it's kind of blobby. It is like the most synthetic fake bouclé ever. But somehow in this little hole in the wall store in Montreal last summer, shopping with the PR crowd, it yelled at me to buy it. So I did. 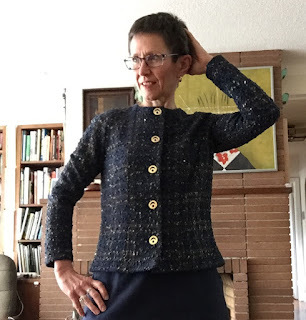 And then it sat in a pile in my sewing room, telling me that it would make a really nice and versatile cardigan to wear with an understated and rather plain dress. 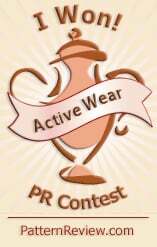 Or with jeans and a dark T-shirt. So I paired it up with some plain dark navy cotton and linen woven. And I made a dress too. Both patterns are OOP. The jacket is Vogue 9548 which dates back to 1996. 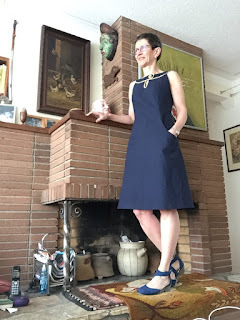 I made the sleeveless dress way back before blogging was a thing. 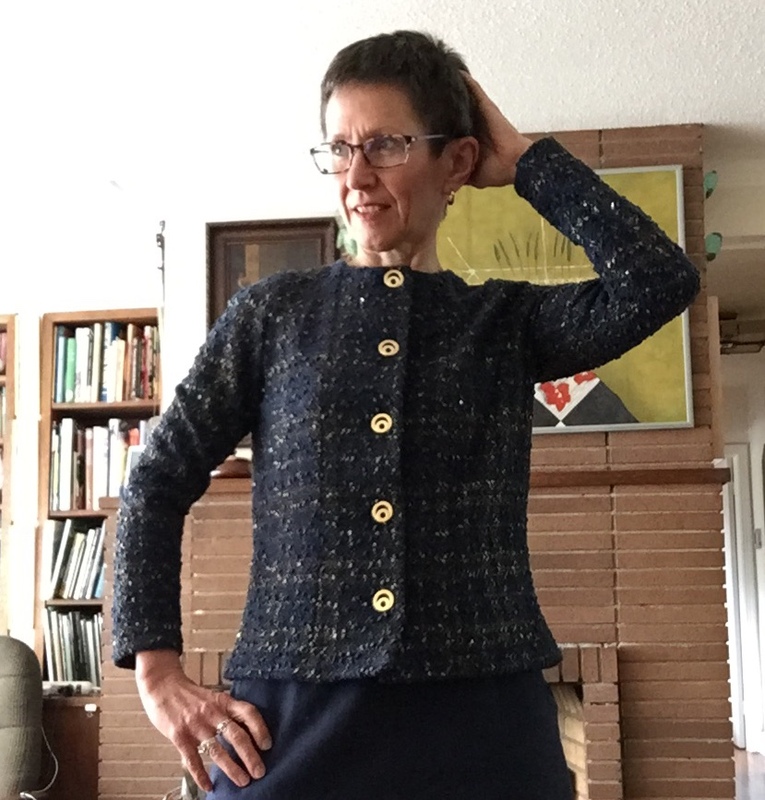 I thought it had definite potential as an unstructured jacket in a not terribly stretchy knit. The sleeves have a darted cap and attach to the cut-in arm holes without much if any easing. I thought I might have to adjust but no, they are quite perfect. I used the cotton-linen to face and stabilize the front and neck openings. No interfacing. 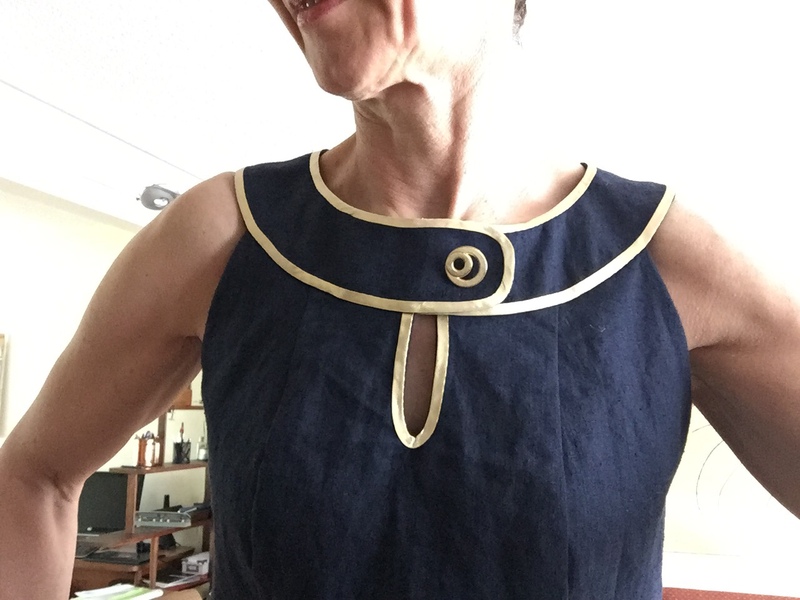 I had to make a facing pattern because the dress is designed to be fully lined to the neck edge. I didn't sew the darts but instead took in the princess seams somewhat at the waist. Easy. The dress is Simplicity 2927, an OOP Project Runway pattern. I modified it so that the pockets are inside the curved princess seam rather than patch pockets. MUCH nicer. The only fitting adjustment needed was to take in the side seams above the waist and let them out a tiny bit at the hip. Oh yes, it has some glitter on it too, and a single matching gold button. 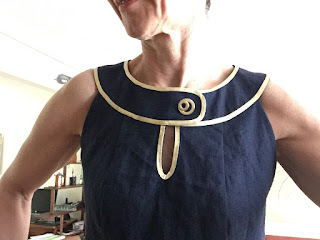 The trim is a curious product from the stash of a local sewing friend who told me she had just the thing to accent this plain dress that would be paired with the flashy jacket. 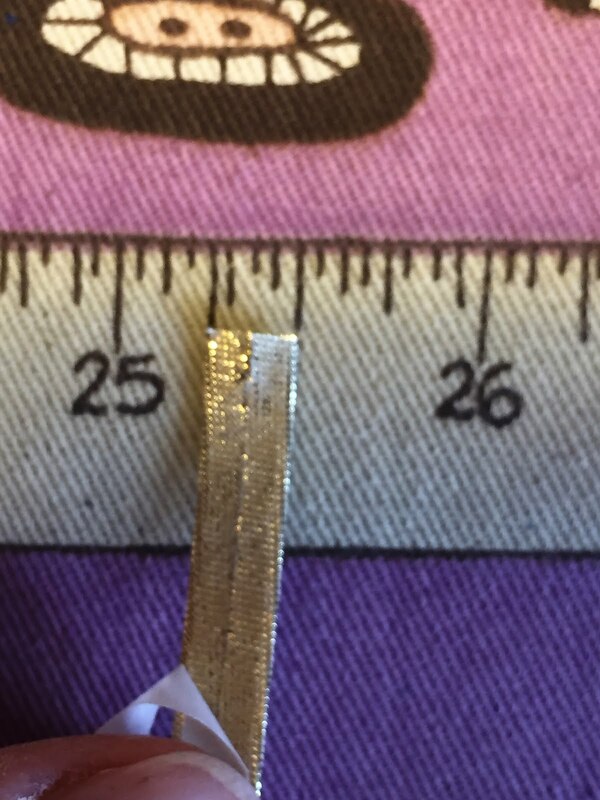 It's a pre-made lamé bias trim, just 1/4" wide, and it's fusible. It stuck to my fabric like nobody's business, and I really hope it doesn't come off in the wash because piercing it with stitches (even in invisible thread) undermines the liquid metal effect. This is why, if you are ever in Vancouver, you should get yourself to Dressew if you possibly can. Take cash and make sure you have plenty of time. Go directly to the basement. You're welcome. Update: That Bionic Gear Bag. I made another one. I modified it so all the pockets are the same size and the same height. This simplified things, and thankfully I did not have to consult the pattern at all. My original bag works for all my hand knitting supplies that formerly lived in a motley collection of plastic zip lock bags. My second one is dandy for my machine knitting tools. I hope never to have to make another, but won't rule it out. They are super useful. 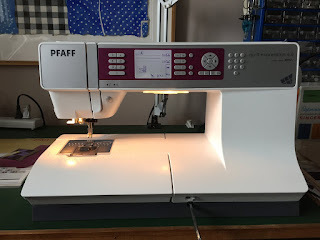 Update: Speaking of machine knitting, I got a bulky (9mm) gauge machine with a ribber and now I am pretty sure I do not need any more knitting machines. This of course does not stop me from compulsively watching the local on-line ads, since that is where almost all of my machines came from after all. Acquisition of this machine, a Singer 151, sent me diving into my stash in search of suitable yarn. Never mind that it is the beginning of warmer weather (we can hope) and thick, woolly sweaters are not necessarily seasonally appropriate. 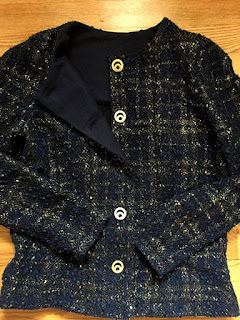 I rediscovered some mohair yarn and made myself a cardigan. It was fun! It involved hand manipulating stitches on the ribber and main beds to make the lattice stitch pattern. The design is sort of my own. 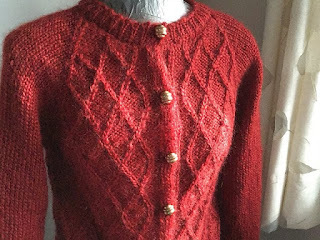 I actually bought a pattern (Ravelry download) but ended up mostly abandoning it because (a) my gauge was slightly different, (b) I needed to knit separate pieces with seams and (c) it had no helpful schematics so I couldn't easily figure out the shaping for the raglan seams. It worked. If I do this often enough, I'll learn to trust myself and stop spending $$ on patterns that don't help much, right? Update: Sewing. I am doing some. I got a new sewing machine. It's a Pfaff quilt expression 4.0, the first generation of the gigantic Pfaffs from (I think) 2008. This machine has a 10" harp, lots of light, a 9mm stitch width and 222 built in stitches including 11 different buttonhole styles. I thought it would take me a long time to get used to the fact that the foot pedal lowers the presser foot (it has a knee lever to lift it up) and that I wouldn't like the auto tie-off feature. However I have adapted really well to these modern features and am really enjoying sewing on this big beast. Its first project was Bionic Gear Bag the second and I think it made the construction easier because I could use both hands to position the project. Currently, I'm working on a dress. It's a pattern I purchased back in the days when I was a mad keen watcher of current patterns and had ready access to all the brands. 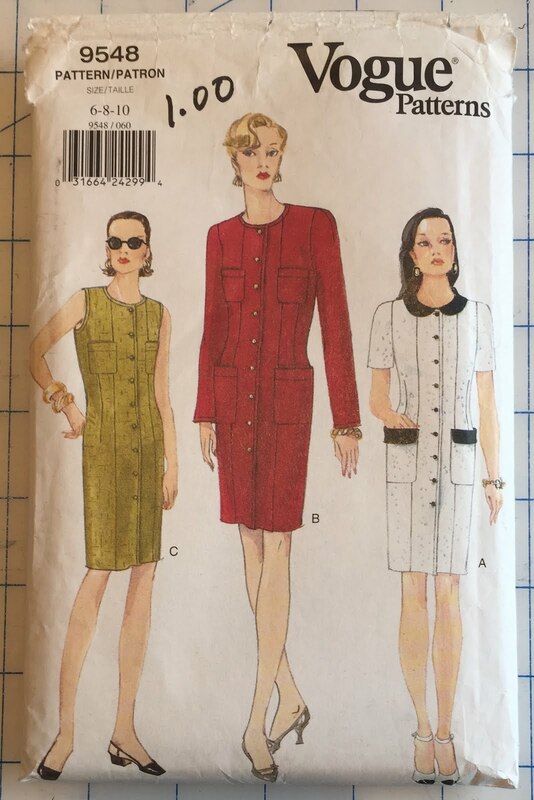 The pattern is Simplicity 2927, a Project Runway dress/tunic pattern. I think this looks like a nice and easy dress to wear for summer and I sure hope it fits. 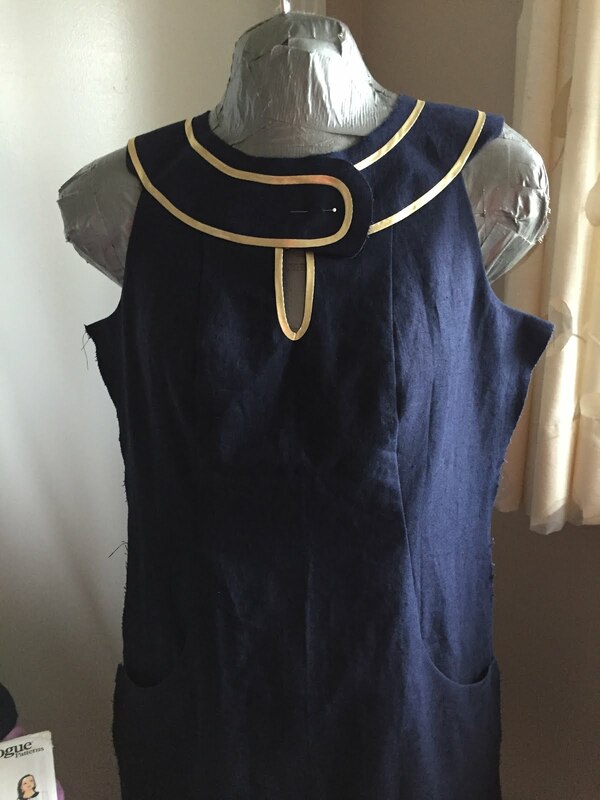 I threw caution to the winds and cut it right out of a length of navy blue cotton/linen blend from stash. 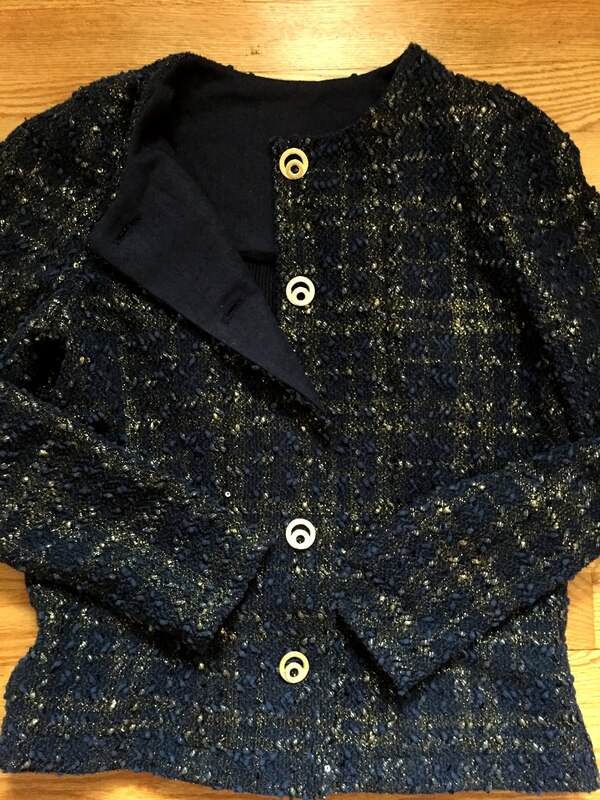 I am going to make a cardigan jacket to go with it out of an interesting sweater knit I picked up in Montreal last year. One of the dress variations has piping at the edges of the round yoke, the keyhole and princess seams. 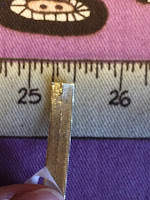 A friend of mine whose stash is even bigger than mine offered me the perfect trim - it's a narrow pre-made and fusible bias trim intended for quilting, and it's some kind of metallic gold fabric. Time will tell if I need to tack down the edges. I have some invisible thread and can use one of the 222 stitches on my new machine to just catch the edges, but I'm reluctant to interfere with the perfection of the apparently liquid gold trim if I don't absolutely have to. At left is a peek of the dress in progress. I decided against trimming the princess seams. Less is more, dontcha know.